Morning came early the first day of our elk hunt in the southern Colorado. When we stepped outside our tent we were greeted with a blanket of fresh alpine snow, and clear skies. After a quick breakfast and a discussion of where we were to hunt, we got saddled up on our horses for the cold one hour pre dawn ride to the area we were going to hunt. On this first day of our five day wilderness hunt we saw a lot of elk. Dad passed on a decent 5 x 5 bull, and I passed on a small 4 x 5 bull. Between the eight hunters in camp four hunters shot bulls the first day. One being a big 6 x 6. The second morning Jay said that he was going to take Dad and I to another drainage. On opening day there were many elk bugling. This is also where the 6 x 6 and another bull were shot opening day. We arrived at first light and were greeted by bugling elk. After we determined the bull was a small 4 x 4 we moved on. A short time later we found another heard of elk with a couple of nice bulls in it. After a short stalk to close the distance Jay spotted the 6 x 6 bull walking towards us at about 250 yards. Just as I got the bull in my scope, the bull moved into a saddle out of sight. We quickly closed the distance to get in position for a better shot. However, we never saw the elk again. The second day ended similar to the first for Dad and I. When we arrived in camp we found out one of the other hunters had shot a bull that evening. The next morning we woke to strong winds. We once again went to back to the same drainage and were joined by one of the other hunters and his guide. The elk were not out where they typically were above timberline. We searched for a couple of hours before we spotted one lone bull across the drainage. After a short stalk and a long shot the other hunter dropped the bull. After skinning and quartering the bull we returned to the horses for lunch and a short break. Later in the afternoon we rode to an area called the triangle, which is where Jay said he had seen a good bull a few times earlier in the fall. We sat next to a spruce tree for an hour or so without seeing anything. When we were ready to leave, Jay stood up and looked around the other side of the spruce tree. This is when he spotted a nice bull with cows feeding about 200 yards away. After numerous shots and some confusion about who shot the bull, we determined that Dad had put the killing shot on the nice 5 x 5 bull. The next morning found Jay and myself heading back to El Paso drainage. We wanted to give it another try because we knew there were a few good bulls there. We arrived before first light to try and intercept the herd of elk before they headed down into the timber for the day. This allowed us to get into position. However, when the elk began migrating down the mountain past us, it was still too dark. We were unable to pick out the big herd bull until they were past us, and he was sky lined. We followed the herd for a short time while the bull was responding to our calls. However, the bull continued moving the herd further into the timber, and down the mountain. So we gave up our chase and another opportunity was lost. We stayed in the area until late in the afternoon glassing and watching elk, but no large bulls were spotted. We started back to camp early enough so that we could stop and glass another area before dark. Upon arriving at this different area, we spotted a herd of elk already in a meadow. We determined that there were a couple of bulls in the herd. However, the area the elk were in contained no cover for a good stalk. After a short discussion, Jay sent me across the open meadow. After closing the distance to approximately 350 – 400 yards the elk began to move as though they were nervous. I decided that this was most likely my best opportunity at a shot. Unfortunately after 3 shots the herd ran off. However, the cows appeared above some timber. After talking it over with Jay we went over to where we last saw the bull, but there was no sign of him. We decided to wait until morning to pursue the bull. What a long night! The next morning found Jay and I back at the timber where we left the night before. We searched the patch of timber that the bull went into. After finding no sign of the bull, we began to move higher to where the cows had gone. Jay instructed me to search higher by the rim rock, while he stayed lower to the timber. After walking a short distance, I spotted a cow elk down below me in the timber. She had not spotted Jay or myself so I backed off and retreated lower to where Jay was. When I reached him he informed me that he had spotted the whole herd in the timber, but had not yet seen the larger bull. We began moving forward to get a better look and had only gone a short distance when we spotted the larger bull. He had also spotted us, and was only about 125 yards. I quickly chambered a shell and took a shot, which dropped the bull. We examined the bull to check for possible bullet holes from the night before, and found a possible wound on the lower front leg. Jay was sure this was the same bull as the night before. The bull was a beautiful 5 x 5 also. The following day we were packed out back to the trailhead. On the way home I reflected on another awesome hunt in the Colorado Rockies. What an awesome experience it is to be able to hunt in such a beautiful place. 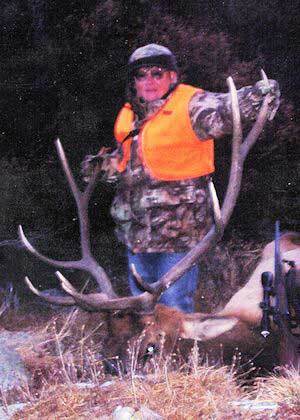 This was the second elk hunt that Dad and I have taken with Jay Mitchell of Action Adventures. 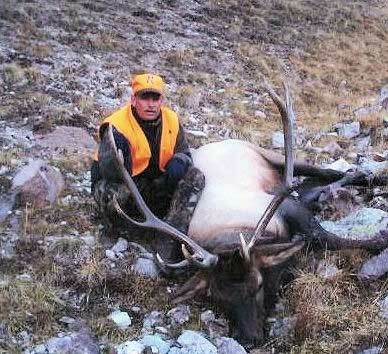 On both hunts we each were successful and came home with Colorado wilderness bulls. If you are interested in a Colorado Wilderness elk hunt, and would like more information, you can contact me at 269-751-4164 or Jay Mitchell at 1-800-383-1888.